Car jacks are typically meant for raising a load. If you intend to get some work done on your car –something like replacing a flat, or getting minor on-road or in-garage maintenance work – you need to prop the vehicle up on sturdy and solid jack stands. This will lend the stability required to keep the vehicle in a safe and stationary position while repairs or replacements are being made. It is important to understand the need for this important tool. 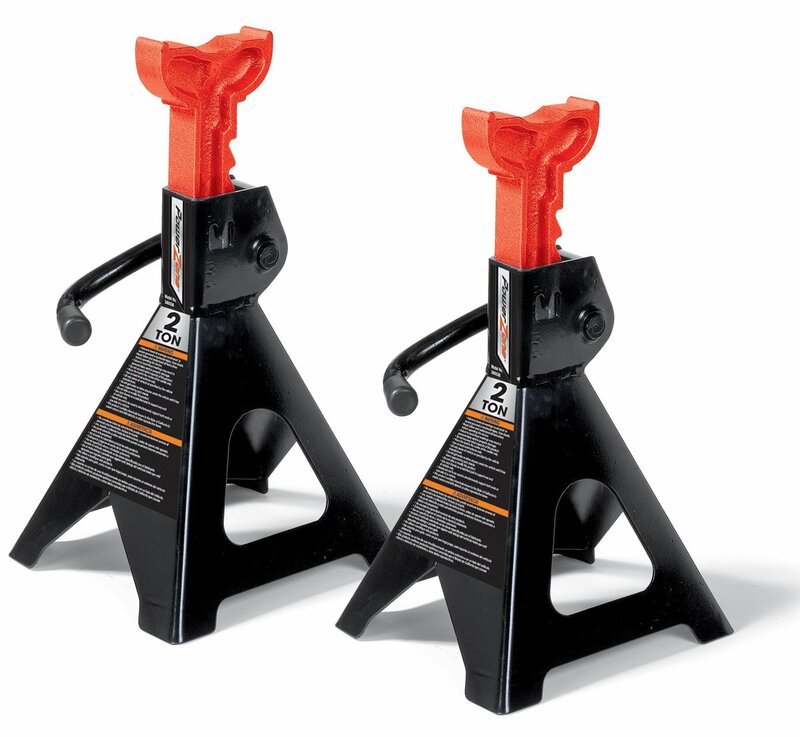 A jack stand is intended to raise the load, while a stand is placed beneath the load. It is not meant to keep the load raised. This is why in some instances an old, used or improperly maintained jack will give way under a load. Choose from five of the best jack stands that we have profiled here to get one that suits your requirements. 1 How Are Jack Stand Rated? 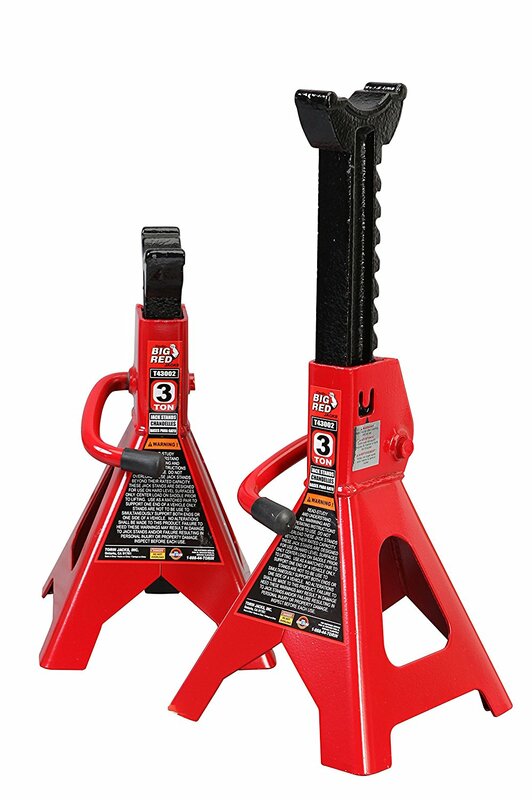 3 What To Look For In The Best Jack Stand? How Are Jack Stand Rated? Stands are rated for the load carrying capacity. 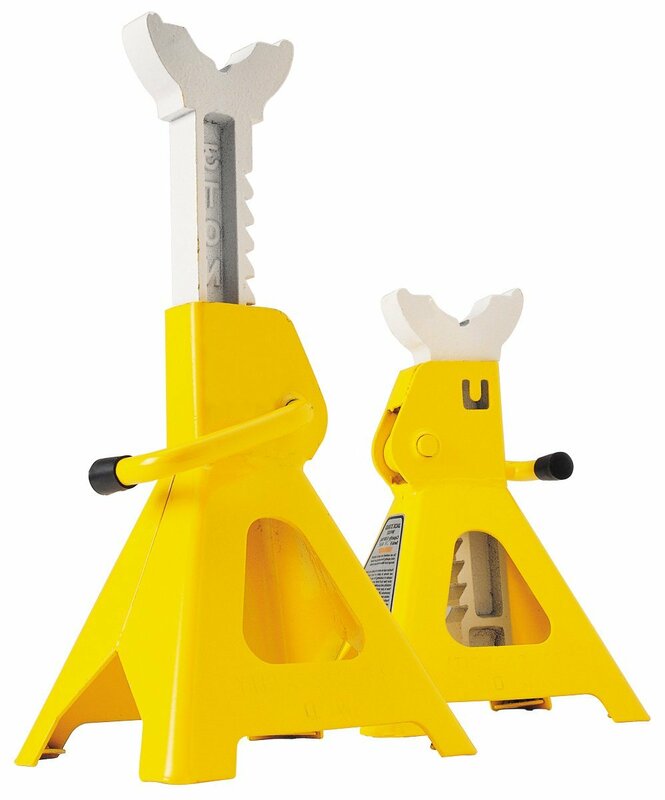 Here, it is important to note that the rated capacity of a jack stand typically denotes the combined weight that a pair of stands can support. It does not indicate the weight that can be supported by a single stand. So, when you shop for a stand, you need to bear two things in mind. One, the weight of the car that you own.Two, the rated capacity of a pair of stands. This way you will be able to choose the from the best car jack stands that will reliably hold the dry weight of your car without giving way. Pricing – At 23.88$ for a pair, you should find yourself happy with this solid pair of stands that stand firm and unshakeable, even over extended periods. Extension Height –The height extension ranges from 11 to 16” and this will take care of most vehicles, permitting easy replacement of flats and maintenance. Rated Weight Support – 6000 lbs between a pair of stands that do not weight too much renders it an impressive quality. 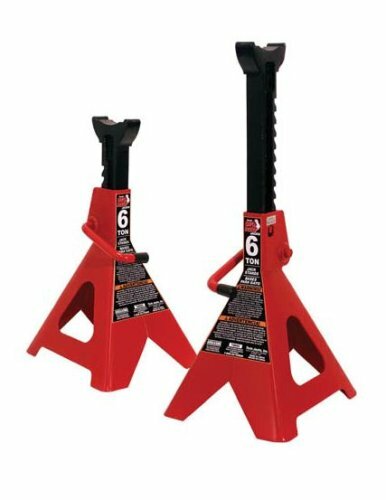 Base Dimensions – With base dimensions of 6 x 7 inches, this jack stand is formidable and reliable. Compact, strong, heavy duty and reliable. This is what you get for 24$. It makes the cut easily and will last long. Pricing – You will not hesitate to shell out 62.16$ after you read the specifications. This is the big brother of the leader and fits a different segment. Extension Height –You get to raise the height from 15 to 23 inches, which is quite adequate, considering the weight of support. Rated Weight Support – 6 tons or 12000 lbs is not a small feat, and this beast does it without a wobble. Base Dimensions – Base dimensions of 6.5” x 7.25” inches give it a firm and wide stance rendering stability to the propped vehicle. Finish could do with a relook to appear shining and new. In an altogether different category from the first, this is a good one, with just the price taking the sting out of it. Pricing – At 99.95$ you may sometimes hesitate to click on the cart. However, rest assured that the extra bucks are for safety and special features. Extension Height –The lifting range of 16-1/4 to 25-3/4 inches makes it tackle most of the vehicles that fall within this weight category. Rated Weight Support – Similar to the previous model, it can effortlessly support 6 tons or 12000 lbs without creating insecurity in the minds of the person crawling beneath the vehicle. Base Dimensions – Withbase dimensions of 10-1/2″ x 13″, you can be sure that a pair of these stands will give great stability. Rusting is an area of concern, aggravated by shipping. Large heavy duty models, the very sight of them will make you confident of their capacity. 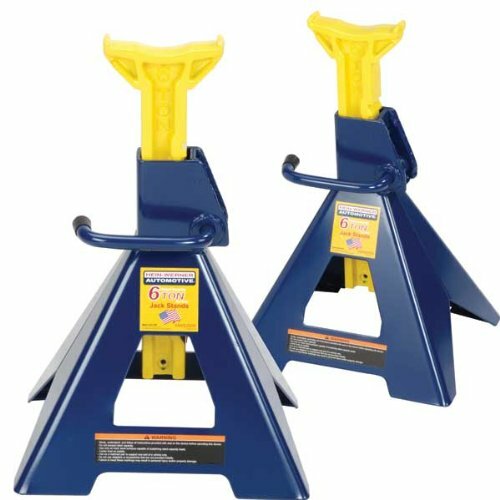 Pricing – 52.35$ for a pair of 6 ton rated stands is certainly a bargain. And surprisingly, quality is impressive enough. Extension Height –At 15-1/2” to 23 1/2 “ you should be able to hoist and hold vehicles that fall within this weight category to carry out repairs and replacements easily. Rated Weight Support – Thisno frills model will hold up 12000 tons of vehicle weight between the two of them without any signs of a struggle. Base Dimensions – Withbase dimensions of 7 ” x 7 ¾ “, you can rest assured that your vehicle will not topple over. Could have done with a few more inches to the height. A decent and reasonably priced product, worth a buy if you are looking for a bargain. Pricing – At 32.37$, this is a good buy, despite the fact that it is a 2 ton model. It offers features that make operation very easy. Extension Height –The lifting range of 10-3/8 inch to 16-3/8 inch will let you handle some of the low height cars without having to go all the way high. Rated Weight Support – The 4000 tons of rated weight carrying capacity are fully supported by the durable heavy duty build quality. Base Dimensions – The base dimensions of 9.8″ x 7 1/2″, make it a solid stand to support your vehicles. The painting needs to improve a lot. If you are looking for a strong and sturdy model at a cheap price, this is the one for you. What To Look For In The Best Jack Stand? Before you drag a choice into the cart, be sure that you pick one with the following points in mind. Safety – Look for some safety features that will ensure that the stand does not give way accidentally. Maybe a safety locking pin, or a dual safety mechanism. Sturdy & Durable – The build quality needs to be good. Look for a reliable model that promises good weld quality. Ease Of Operation – If the model offers convenient operating features, like a ratchet handle, it will help you to handle it easily. Height – Ensure that the stand is ideally suited to the profile of your vehicle, not too much, not too low.